For a while, there was something about the Sony Cyber-shot DSC WX7 that we couldn't quite put our finger on. However, now we know what it is. Look at it - at first glance it's juat a simple, grey rectangle that would be a perfect companion for the happy snapper. But then look more closely at the specification: 16.2 million pixels sat in front of Sony's prestigious Exmor R CMOS sensor, AVCHD Full HD video, Carl Zeiss lens, 3D sweep panorama, stereo sound, background defocus and multi shot layering. That feature-set is more at home in a prosumer model costing upwards of £400. However, at around £200, the price is tempting but it may be the unusual and advanced features that dissuades you because of their complexity. If that's the case, we're going to take a look at them now and hopefully put you at rest. 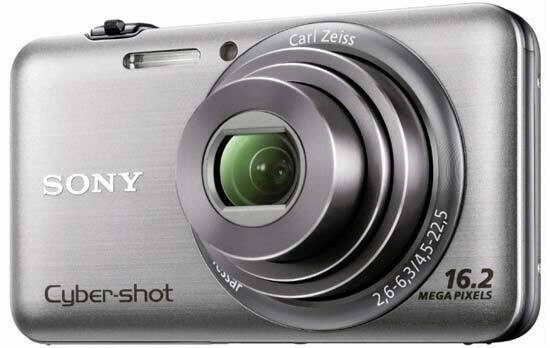 The Sony DSC-WX7 is available in silver or black and costs around £229.99. As we said, the Sony Cyber-shot DSC WX7 is a simple, grey rectangle but that's not to say that it's in any way ugly. In fact, the clean, sleek lines and small rounded corners make for an attractive unit. The lens barrel - although only holding a modest 5x optical zoom - takes up the majority of the front. An ultra small flash sits just next to the lens along with the AF light. The design makes us think that this is a camera styled for the tech-savvy and types that aren't into all this retro malarky. It's extremely futuristic and minimal. The power button is a very small affair and sits into the body so as not to attract attention. This is also useful for not accidentally pressing it instead of taking a picture. The shutter release has been retained at a size normally seen on larger cameras but the front 25% has been squared off to fit with the front of the camera. This odd shape would normally be problematic for operating the zoom switch as it needs a perfect circle to wrap around. Sony have overcome this by making the shutter release turn with the zoom switch. After all, you're not touching the shutter release when zooming so it doesn't really matter. On the back of the Sony Cyber-shot DSC WX7 the features look pretty simple but Sony have integrated them with the screen, so accessing them will enable alternative options on screen. The top switch moves between taking pictures, panoramics and video. Panoramic pictures are taken using Sony's sweep panorama and new 3D sweep panorama. A dedicated video button is located to the right of this switch and is close to the thumb for fast acting video in case of a candid situation. The small ring in the middle can be pressed as a left, right, up and down navigation pad or rotated like a command wheel when there's a mode to adjust on the screen. Scrolling the wheel at any other time accesses the mode dial where you can choose the mode you want the camera to be in. There are 6 options including intelligent auto, superior auto, program, 3D shooting, scene modes and background defocus. The latter mode works by taking two pictures, one in focus and one out of focus. It then masks the sharp area of the photograph and layers it with the out of focus background to create depth of field. This technique came about because digital compact camera sensors are very small and so have a wide depth of field. Backgrounds that would be out of focus on a DSLR at f/8 are perfectly in focus on a compact camera. Therefore the need to cheat is necessary. The WX7 harbours one of the best sensors available today. The Sony Exmor R sensor is one of the first back illuminated types released on the market. It works by removing the circuitry that normally surrounds each pixel and places it on the back of the sensor. The circuitry can sometimes block light getting onto the sensor which means the light signal is weaker. To boost the signal, the camera will adjust ISO which also introduces noise. The removal of the circuits obviates the issue and allows for lower ISO to be used in low light which gives smoother pictures. If that's not enough, the new Sony superior auto system betters intelligent auto by producing what Sony call DSLR quality images. It works by taking a series of pictures in a row of the subject at different settings. It then selects the bits of each picture that have the best focusing and exposure before merging them all together into one perfectly focused and perfectly exposed image. The Sony Cyber-shot DSC WX7 appears to be made to a high standard. The metal casing ensures durability while there are no bits sticking out that can get caught and snapped off. There are one or two areas we'd like to see changed. For example, the USB port is exposed yet the HDMI slot has a cover. The battery door, although not bendy at all looks like it's made from a bit of weak plastic. The bit that infuriated us most was the mode dial. It's worth noting that this only annoyed us because of the way we operated it and we understand that anyone using it the opposite way shouldn't have this. To go to a mode that was above the one we were on, we moved the dial up (placing our thumb on the left side of the dial and turning it clockwise) but this brought the mode up from below the one we were on, so we had to rotate it the other way. Placing our thumb on the right side of the dial would correct this because to move to the option above would move the dial anti-clockwise and bring it the right way. We think that it's because the display is on the screen and we think that if the modes were physically on the dial, it wouldn't be an issue. To us, it was an optical illusion: To move up, we moved our thumb up where we had to move it down. Should you decide not to use the mode dial, you can still access the main options by going into the main menu. There's also an easy mode for simplifying everything if it all gets a bit too much. One thing we find interesting is the lack of a macro mode. The camera has a macro focusing of 5cm at wide angle but there's no way to enable it. That's because it's integrated into the camera anyway. We've thought for a while that the macro mode is simply redundant because the picture quality doesn't change regardless of the mode so why not just have the lens focusing from macro to infinity and that's what Sony have started to do. Instead of separating the quick access functions and main menu with two different buttons, Sony have placed an option to enter the main menu in the function menu. This is a clever little idea that makes space and reduces clutter on the camera. The main menu accesses the more core areas such as what video format to use, the red-eye and blink alert values as well as colour, noise and language settings. When the camera is first turned on, you can set the colours. There's a choice of three: Orange and black, orange and white or hot pink and light pink. You can change this in the display colour setting if you want to. The Sony Cyber-shot DSC WX7 has a dedicated playback button in the bottom right of the body. The delete button is situated next to playback button and when you're not looking at the pictures you've taken, it works as a help guide to aid your picture taking skills. Changing the display in the playback mode will bring up all the information about the picture such as ISO, white-balance, aperture and shutter speed as well as the file name and histogram. In the menu there's viewing modes, retouching options and delete options too. In the box, the Sony Cyber-shot DSC WX7 comes with a quick start guide as well as the full user guide on the enclosed CD. The CD also includes Sony's PMB (Picture Motion Browser) version 5.5 for tagging, editing and uploading your pictures. Hardware that comes with the camera includes a mains plug for the charging unit. Although it's not a stand alone type. The charging unit has a USB port that then goes straight into the camera. This means that the camera can be plugged straight into a computer to charge and is great for if you're travelling.